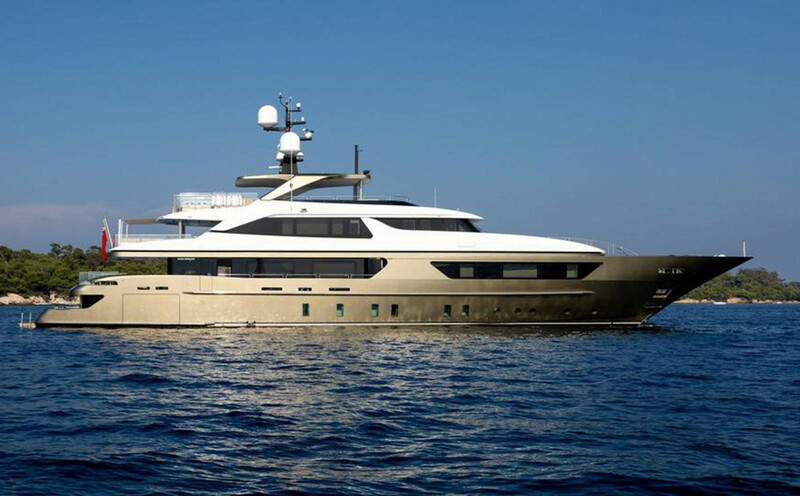 With exterior styling and interior design by Francesco Paszkowski, Trident was built in steel and aluminium by Italian yard Sanlorenzo and delivered in 2014. Accommodation is for 10 guests in five cabins comprising a full beam master suite on the main deck, VIP suite, double and two twins. All guest cabins have entertainment centers, television screens and en-suite bathroom facilities while the crew quarters sleep nine staff aboard this yacht for sale. Both the upper and main aft decks are optimized for al fresco entertainment and dining with U-shaped seating and low tables, while the vast sun deck has a dining area for 12 guests a bar, barbecue and grill sheltered by a custom hard top. Aft is a sunbathing area including a Jacuzzi, sun pads and sun loungers. Other features include a well-equipped gym, beach club and an elevator connecting the three upper decks.